Mark Geoghegan, or Mockie, as he was known to his family and community left this life very prematurely on 1st March 2013 not even a year since he was Grand Marshall of our St. Patrick’s Day parade. Mockie was the youngest of six children born to Mary and Mark Geoghegan of Bridge Street, Oughterard. His father, Mark was a great horseman and his mother Mary was a great businesswoman who ran her shop at Bridge Street well into her eighties. From a very young age Mockie showed every sign of being a great businessman himself. His many talents were in evidence - one day his mother saw a car been driven at great speed on the Station Road and it didn’t seem to have a driver! However as it passed the house Mary saw her youngest son, barely visible behind the wheel! He was no more than ten years old and was so small he could just about see where he was going. He had hotwired the car in the Chapel Yard and taken it for a spin, his first driving lesson! He got a good telling off for that escapade but that didn’t put him off cars. He went on to become a great mechanic. Mockie trained as a car mechanic in Dublin and England before going to work for Western Motors in Galway – a Fiat Dealership in those days. Fiat chose Mockie along with five others from all over Ireland to go to their main factory which was situated in Turin, Italy to train as a Fiat specialist. As well as his great love for cars, Mockie had a great love for music. Again this was evident from an early age. At one stage he was very sick and was confined to bed. There was always an accordion in the house at Bridge Street so to keep him in bed and to pass the time his sister Mary Rose got a music book and marked out the notes on the keyboard for him. This was the start of his music career. 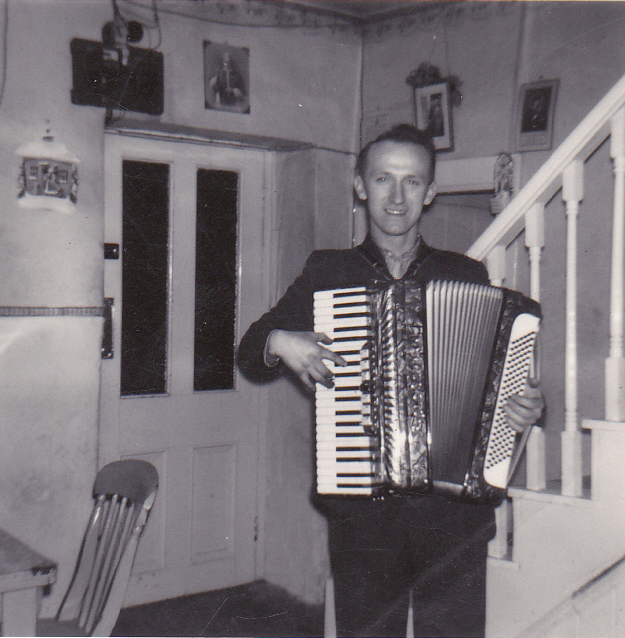 He eventually started his own band and played with Paddy Halloran and Freddy Tuck and many others. When the band broke up Mockie continued his solo career with his electric keyboard and accordion. His skills as an entrepreneur were always evident. When the film projector from Sullivan’s Hall came up for sale he bought it with his sister in law, Angela. Mockie would order the film reels from a distributor in Dublin and every Friday they were put on the Galway train. CIE would then put them on the Oughterard bus and they would be collected at The Angler’s Rest. There was a showing in Sullivan’s Hall on Friday nights and in Roundstone on Saturday nights. Business was very brisk initially but after a few months things started to slacken off so Mockie thought it could do with a bit of spicing up and he ordered an over 18 film Well the business never looked back! After starting his own very successful garage in Oughterard, Mockie also drove the school bus for years. He did the public address system for all the pony shows, pony races and any other events that he was hired to do all over the county and beyond. He was much loved by all his nieces and nephews as an uncle who never aged, who was always full of fun, adventure and more than willing to give his opinions. The huge turnout at his funeral was a tribute to his standing in the community. May he be remembered well.